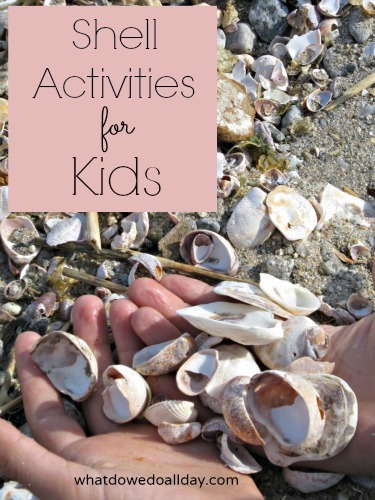 Do your kids like to look for shells at the beach? I’ve always found something so satisfying about looking for shells, finding them in the sand, turning them over and over, comparing them to the others I’ve already placed in the bucket. Even though kids don’t necessarily need any shell extension activities other than just enjoying and exploring the natural beauty of shells, it’s still fun to bring the shells home and use them in our everyday play and add them into the mix of our other indoor activities. 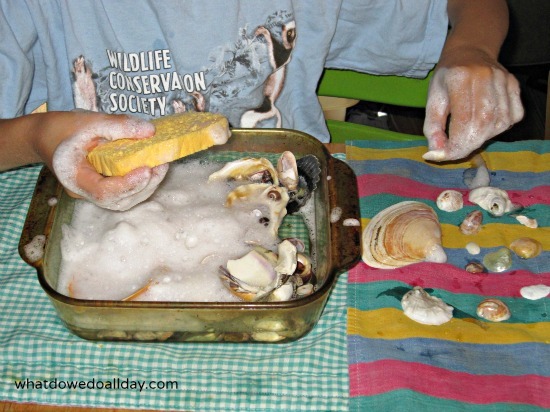 Do you wash the shells after you bring them home? I insist upon it ever since we had a little beach fly incident. (Fortunately that incident occurred with shells that were closed up inside a jar. Whew!) Give your kids a bucket of soapy water and a scrub brush so they can pretend to be scientists, cleaning and polishing their specimens. I think Kiddo liked squeezing the soapy sponge as much as he liked digging around in his new shell collection! In the past, we’ve used seashells as objects for still life art drawings. I’ve got some easy instructions for how to make an ocean in a bottle. Every ocean needs some shells. Shells are fun to sort into muffin tins. Use tongs or chopsticks for fine motor work. No Time For Flash Cards: Beach sensory bin. Strangely, we don’t find many shells on the beach here – perhaps because the ocean is so cold. We do have a shell collection that I need to get out again one of these days! We’ll have to do your activities with the shells we brought home from Florida! It’s nice to have them on trays, too, because then the kids an pick them up and look at them whenever they want. In most beach areas, collecting natural items like shells is illegal. It’s not really a good thing to take shells from any beach. And I’m sure that no one wants to teach their children to degrade what remains of our nature areas. I’d suggest buying your shells from a store. 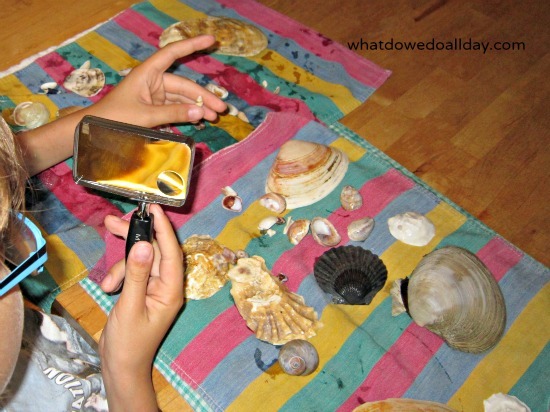 Love the seashell exploration – it is amazing how much you can learn when you look at those shells. The kids were at the beach this past week w/their grandparents so we have a lot of shells to explore now. Thanks for sharing at Discover & Explore – we are featuring you this week!